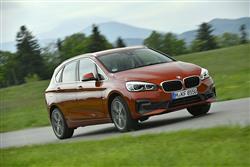 The 2 Series Active Tourer will be remembered as the first front-wheel drive BMW. Here's the revised version. Jonathan Crouch looks at what's on offer. Front wheel drive and BMW. It's not often you see those words in the same sentence. 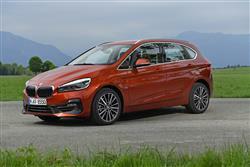 Equally unusual is the idea of any kind of BMW MPV. 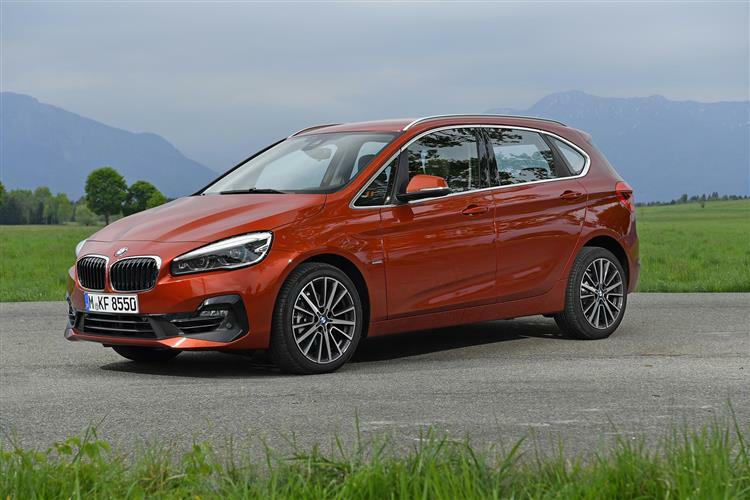 We're here though, to look at a car that brings all of these things together, the Munich maker's 2 Series Active Tourer, a five-seat people carrier that's here been usefully updated. In 2006, BMW ran an advertisement in many popular magazines. It featured a rabbit with puny back legs and outlandishly big front legs which looked plain wrong, underlined with the caption "That's why we don't have front wheel drives." The message was clear. Cars that sent their power to the front wheels were inherently second rate, an exercise in cost-cutting. Fast forward to today. 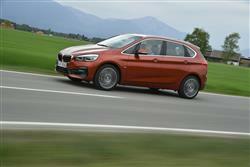 One of BMW's best selling models is their 2 Series Active Tourer. And it's front-driven. Some may call that hypocrisy, while others recognise that BMW needs to adapt to a changing marketplace. It's also true that BMW has been building and selling front-wheel drive cars for years, albeit with MINI badges rather than BMW roundels on their noses. 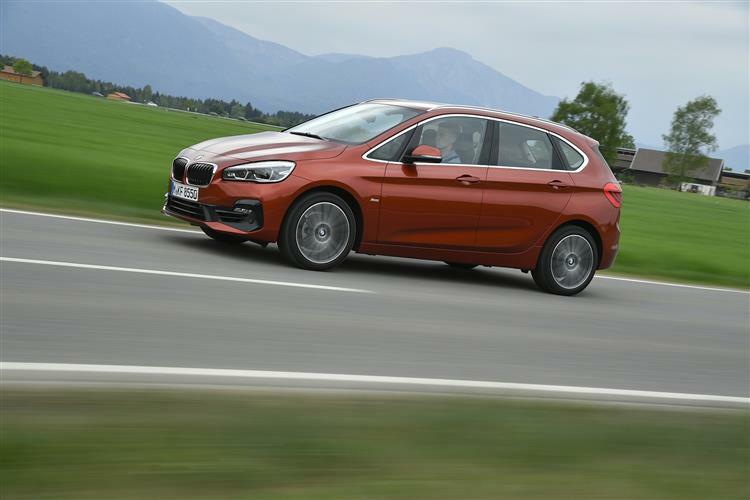 Almost 20,000 2 Series Active Tourer models have been sold in the UK since the original launch in 2014 and the UK is this model's third best selling market. So it's important for BMW to get this revised model right. Just because this vehicle drives the front wheels doesn't mean that BMW has decided to go on a manic cost-cutting frenzy. Where you might expect to find a compact torsion beam rear suspension, BMW has instead fitted a much more complex and expensive multi-link rear end. It's almost as if the Bavarians are overcompensating for something. 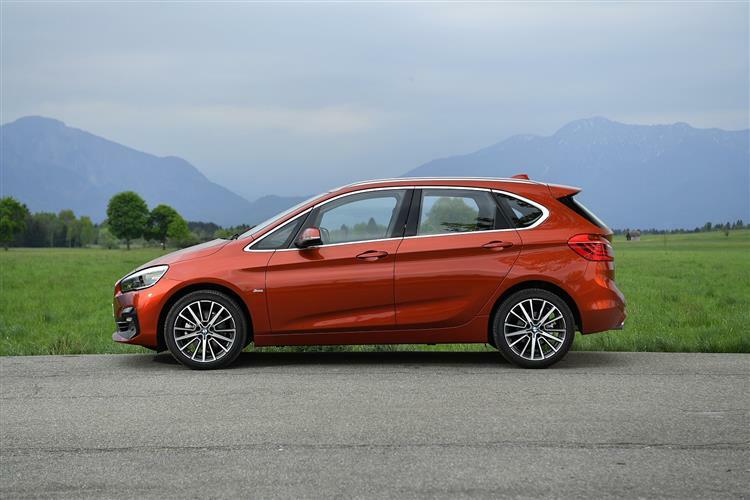 The 2 Series Active Tourer also benefits from a chassis where weight has been taken out where possible with the use of ultra-high strength steels in key stress points. As before, a broad selection of three and four cylinder engines are on offer, plus there's a petrol Plug-in hybrid variant if you want it. For petrol people, there's the three cylinder 218i with 140hp and the four cylinder 220i with 192hp. Beyond that's, there's the 225xe iPerformance Plug-in hybrid, which mates the 218i engine with an 88hp electric motor and puts out a combined 224hp. Diesel buyers are offered three options; the three cylinder 216d with 116hp, plus a couple of four cylinder options, the 150hp 218d and the top 190hp 220d (also available with xDrive 4WD). The mainstream powerplants team up with three transmission types, including a new seven-speed dual-clutch Steptronic unit. 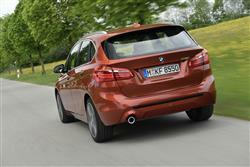 BMW xDrive intelligent all-wheel drive is also available. Turbocharging for all four-cylinder units is now a two-stage arrangement involving twin turbos. This enables even quicker engine response with increased efficiency. This is a compact MPV and as such, it's fairly inevitable that the basic shape is going to be somewhat generic. Cover the badges and grille and most would probably identify this as a Mercedes. The details are nicely executed, but this remains one of the more conservative designs, though BMW has tried to liven up the look of this revised version a little with a larger front kidney grille, redesigned front fog lamps, smarter wheel designs and twin tail pipes on all four cylinder variants. As before, this Active Tourer runs on a lengthened version of the MK3 generation MINI chassis, with the wheelbase extended to 2,670mm. Here, we're looking at the five-seat Active Tourer, but there's also a mechanically-identical 7-seat Gran Tourer body shape available. 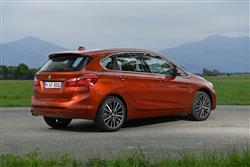 For a company with no real track record in MPVs, the Munich maker has clearly been studying what works in rival cars. There are sliding and reclining rear seats that allow you to prioritise space for passengers or luggage. Maximum boot space is a respectable 468-litres - which is 20-litres less than the Mercedes B-Class. The rear bench is a versatile thing that can split 40:20:40 and when fully folded there's access to up to 1,510-litres. The front passenger seat also folds to accommodate items up to 2.4m long. Interior changes to this revised model include redesigned seats and a smarter auto gear lever. 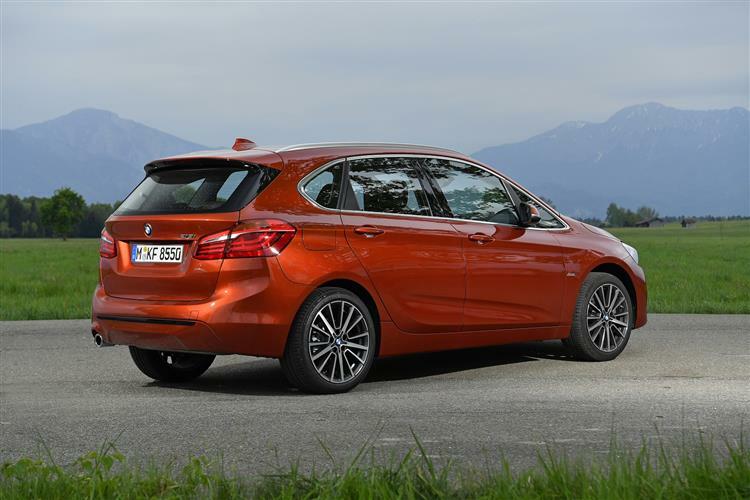 Inevitably, this Active Tourer model sits at the premium end of the mid-sized five-seat MPV segment. Prices start at around £26,000 and rise to around £35,000. A 7-speed Steptronic auto 'box is optional with the three cylinder engines, while an 8-speed Steptronic auto is offered either as an option or as standard on the high-torque powerplants, depending on the variant you're looking at. If safety's a priority, you'll want to look at the optional 'Driving Assistant Plus' package. This includes 'Active Cruise Control' and a 'Traffic Jam Assistant' that, in heavy traffic, is able to control the car's speed, steer automatically and keep it in its lane. Also available is Lane Departure Warning and the City Braking function, which applies the brakes automatically at speeds up to 37mph in response to an imminent collision with a car, motorcycle or pedestrian, for instance. The Parking Assistant takes care of manoeuvring into parking spots that are either parallel or perpendicular to the road, while its ultrasonic sensors also help to search for suitable spaces up to a speed of 22mph. The 1.5-litre turbo petrol engine that many customers will inevitably gravitate to in the 218i variant makes some extremely good numbers, recording 48.7mpg on the combined fuel economy cycle and 132g/km. Economy figures that good make you wonder why you'd pay extra for the diesel but the additional torque of the 216d will prove a draw for many and 65.7mpg combined cycle economy (113g/km of CO2) isn't going to put too huge a dent in the family budget. The usual suite of BMW EfficientDynamics energy-saving features is responsible for making those vaguely implausible looking figures, including Auto Start Stop and ECO PRO. When in ECO PRO mode, the throttle response is adjusted to encourage a more economical driving style. The extra economy created in that ECO PRO setting is fed back to the driver, with the in-car displays showing the additional number of miles achieved. The ideal choice for eco-minded buyers will of course be the iPerformance 225xe Plug-in hybrid version. BMW claims this derivative when fully charged can offer you a 28 mile all-electric driving range. Combined fuel consumption is 122.8mpg, which equates to CO2 emissions of 52g/km. Owners will need around two-and-a-half hours to fully recharge the lithium-ion cells from a standard domestic power socket using the standard charging cable. Faster charging is possible from a BMW i Wallbox, which can top up the battery in around one-and-a-half hours. Did you ever expect to see a BMW model range built around front wheel drive with an MPV body shape and offering the option of a three cylinder engine? We're not sure we ever did. Of course the front-driven layout gives this 2 Series Active Tourer a less driver-orientated feel than you'd find in other BMW models. The brand's traditional buyers may not like that, so it's just as well that this car isn't aimed at them. 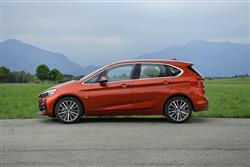 No, you'll be interested in a 2 Series Active Tourer if your need for practicality is greater than your need for a BMW. But you'd still rather like one. If that makes sense to you, then this car will too. Its closest rival, the Mercedes B-Class, doesn't have the same kind of spark and the only other alternative is a much frumpier more conventional mainstream brand MPV. All of which means that BMW's appealing spin on ordinary family motoring will probably continue to attract a ready audience. People who probably never thought they'd be buying from this Munich maker. They won't be getting 'the ultimate driving machine' because that's not what they need. Getting instead what may very well be 'the ultimate small people carrier' will suit them very well indeed. Where can I charge it?